Eurocom has done it again with its innovative designs. 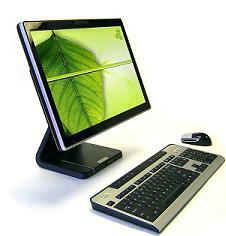 This time instead of a desktop replacement notebook, which is their specialty, it is an Eco-friendly PC or the green desktop. What ever you want to call it, this all-in-one product basically eliminates the mouse completely. Its touch screen technology enables users to navigate the screen and open and close documents and programs with the touch of a finger or with a stylus (included).